I saw this outside my window after dinner and rushed outside to see if I could capture it. I mostly use my iPhone because that's what I have. Often the phone just can't seem to capture what I see with my eyes. Tonight was different. This is exactly what I saw. glad you captured it, deanna. I just love that picture...so idyllic! Welcome to Creekside Cottage - a place of Hospitality, Friendship and Encouragement! Rachel surprised us Friday night by banging on our deck door! We had no idea she was coming! I told her, "You didn't give me the opportunity to worry about you driving all that way!" I don't really worry, but I do think about them and pray when they are journeying. On Saturday we went to Aimee Weaver's Fall Market at her small farm. It was raining so they moved everything inside. Aimee goes to my parents (we used to go there) church, and is a lovely person. She has grown her business, and I love that she uses her creativity to bless other people. A popular thing at her market was the chance to paint your own sign. Here my sister in law is painting the sign she free hand designed. This one is mine and I traced and filled in! I loved it though, and its got my creative juices flowing! After church, we went to lunch with friends, then home for a few hours before we left to go to a Rend Collective concert! Rachel, my mom and I have seen them four times - the first time with Chris Tomlin when they were his opening act. Last night Tim, Sarah (who has been one other time) and my dad went with us, along with a friend. We like them a lot. They are Irish, high energy, and they have a true heart for the gospel. Their songs have truth in their lyrics too. We are all words people, being big readers, and the lyrics are important to us. Tim and I enjoy a concert very differently. The girls asked if he liked the concert, (they had sat with friends down on the ground level, so they could jump, and we sat in the balcony so we could see!) and he said that he really did. This morning I had tea in my cottage garden with my darling Rachel. She is off to school at the end of next month, working a lot, and getting lots of friend time in. I was happy to have time together, talking and enjoying the lovely scones. Rachel is a coffee girl but she loves a good scone. This was one of the dreams I had for my little sitting spot in the garden, to share tea and conversation amidst my lovely flowers. 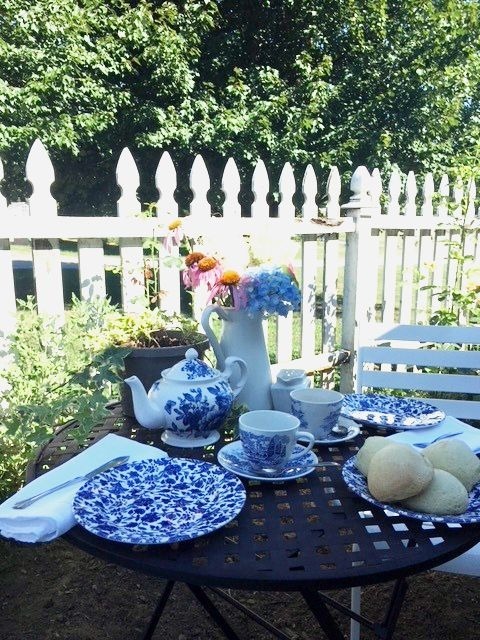 Tea Cups: Countryside - Enoch Wedgewood (Tunstall) Ltd.
Scones: Purchased Frozen, and ready to bake, at The Tea Trolley in Delta, PA.
Have a lovely day, friends! I Have A Mowing Story To Tell!